The good news is that enterprise-grade BI software is becoming increasingly diverse and affordable. This recent Forbes article provides a concise rundown of the data visualization power-players. 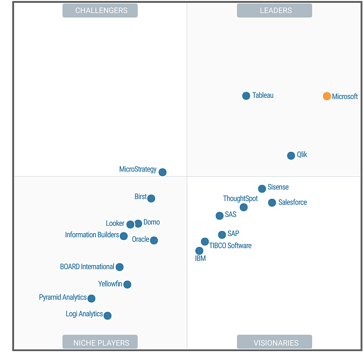 Power BI, Tableau, and Qlik are the most popular on the list (and rank highest on Gartner’s Magic Quadrant for Business Intelligence), and we’re excited to see additional up-and-comers in the market . As a Microsoft-focused data analytics firm, we’d be remiss if we didn’t applaud the many companies increasing the availability of BI. BI is no longer the sole domain of enterprises. In fact, with an ever-widening field of data visualization tools on the market, we’re seeing more nimble mid-market and small companies make the biggest strides with their data. If you haven’t yet jumped on the data train, we encourage you to take a look at the latest offerings. Having managed businesses for decades (and having tried virtually every management tactic), we’re convinced that putting your data to work is the quickest, most affordable way to transform your business for greater efficiency, growth, and profitability. Take a look at our Case Studies or our Manufacturing and Supply Chain Webinar for real-world examples of the impact data can deliver.